How Can Plantar Fasciitis Be Treated With Herbal Remedies? Plantar fasciitis is one of the most common cause of pain in the bottom of the heel. This is the painful condition in which there occurs inflammation of the weblike, thick ligament which connects heel to the front of the foot, i.e. plantar fascia. Plantar fascia supports the arch of the foot and helps in walking. It is repetitive strain injury which affects walkers, runners, hikers and all others who stands for living like cashiers. People who work or run on a concrete or hard surface are at high risk of developing plantar fasciitis. There is a stabbing pain usually in the morning when the person steps out of bed. Continuous movement of the feet decreases the pain but returns if there is long-standing or sitting. WHAT CAN BE THE SYMPTOMS OF PLANTAR FASCIITIS? Pain on the heal bottom. Some may get pain at the mid-foot area of the bottom. One or both feet may be affected. Pain may be sharp or dull in nature. Pain radiating outward from the bottom of the foot or heal. The sensation of burning at the bottom of the heel. Pain worsens in the morning or at first step out of the bed. The stiffness of heel which makes climbing the stairs difficult. Aggravation in pain after prolonged activity. WHAT CAN BE THE CAUSES OF PLANTAR FASCIITIS? Obesity or sudden weight gain as in pregnancy can result in this condition due to increased pressure on the plantar fascia. Having a very active job in which a person has to be on foot all the time. Structural defects in the foot like a high arch or flat feet. HOW CAN PLANTAR FASCIITIS BE DIAGNOSED? For the first step of diagnosis, you must visit a doctor who will evaluate the condition by physical examination. The doctor might push on the plantar fascia while you flexing the foot to check if the pain worsens. The pointing toe may ameliorate the pain. After this physical examination, your doctor may advise you to take some tests like MRI and X-ray to rule out any other cause of foot pain. Old school treatment of this condition includes injection of corticosteroid in the affected area which relieves the pain. Along with this, some physical therapies are given. All these medicines might have many side-effects and usually controls the pain temporarily. 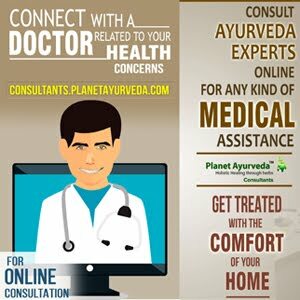 Planet Ayurveda offers Ayurvedic remedies for the treatment of Plantar Fasciitis. 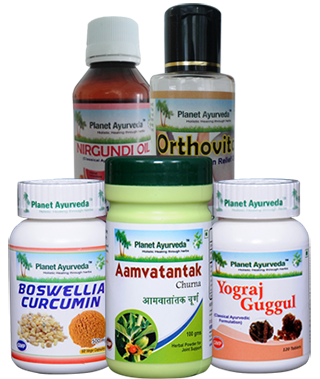 All these remedies are prepared from pure and authentic herbs under the strict ayurvedic principles. All the products are free from chemicals, preservatives, and additives. These remedies are purely vegetarian and none of them are tested on animals. All these products are free from side-effects if taken as prescribed by the physician. It is a herbal combination of various Ayurvedic herbs which are used to relieve pain and reduce inflammation since ancient times. A healthy metabolism is maintained and toxins are removed from the body by using it properly. Some of the herbs used to prepare this herbal blend are Commiphora mukul (Guggul), Cyperus zeylanica (Nagarmotha), Plumbago zeylanica (Chitrak), Emblica officinalis (Amla), Terminalia bellirica (Baheda) etc. Anti-inflammatory properties of it helps to relieve pain and swelling. Yograaj guggul helps to reduce fat in obese patients which is one of the main reasons of plantar fasciitis. It clears toxins and burns the ama deposited around joints which causes pain. Fibromyalgic pain can also be relieved by its use. It reduces stress and relieves muscle cramps. The skeletal and neuromuscular system is strengthened by Yograj guggul. DOSAGE: Take 2 tablets, twice a day after meals with plain water. This is a combination of two wonderful herbs Shallaki (Boswellia serrata) and Curcumin (Curcuma longa) which are enriched with medicinal qualities. Boswellia curcumin is one of the most effective herbal blends to relieve inflammation and its associated symptoms. It relieves pain and swelling of the affected area. Reduces stiffness and increases mobility. It also relieves back pain, ankle joint pain, elbow pain etc. These capsules also treat and prevent the infections owing to its antibacterial, antifungal and antiviral properties. DOSAGE: Take 1-2 capsules two times a day after meals with plain water. This churna effectively treats rheumatoid arthritis and similar conditions involving joints and muscles pain. It is a combination of various herbs like Withania somnifera (Ashwagandha), Curcuma longa (Haridra), Trigonella foenum graecum (Methi), Colchicum autumnale (Surnajan), Sphaeranthus indicus (Gorakhmundi) and Zingiber officinale (Sonth). It effectively reduces pain in the joints. Inflammation and swelling can be reduced by this amazing herbal blend. This churna helps to maintain vigor and body strength. Stress and anxiety is relieved by it. Aamvatantak churna also removes toxins and purifies the blood. DOSAGE: Take half to one teaspoonful of churna twice a day after meals with plain water. Nirgundi oil is a herbal oil which is well known for its pain relieving properties. This oil is prepared from single herb Nirgundi (Vitex negundo). Nirgundi is derived from a Sanskrit word which means "which protects the body from ailments". It relieves pain due to its analgesic property. This oil helps to treat skin diseases like leucoderma, leprosy, and vitiligo. Various medical conditions like sciatica and arthritis can be treated with the help of nirgundi oil. This oil is a herbal combination of Shulgajendra oil, Gandhpura oil, Tarpin oil, Saindhavadi oil, Prasarini oil, and Camphor. Orthovita oil supports healthy muscles and joints. This oil helps in restoring mobility of the joints. It relieves pain, swelling, and stiffness of the joints. Orthovita oil helps to treat osteoarthritis, rheumatoid arthritis, neck pain, and muscle pain. It effectively treats all types of pain. USAGE OF THESE OILS: Take equal quantity of both the oils. Mix them properly and take it on your palm. Now gently rub this mixture over the painful area and wrap that area with warm cloth for at least 2 hours.